Welcome to the first step in the Satanic journey: curiosity. This page for beginners! It is here to give you some of the basics about Satanism. Explore the introductory videos and podcasts posted on this page, and read through some of the summary bullet-point lists below. When you are ready to explore and learn more, you may advance down the path and take your understanding to the next level. At it’s most basic, it’s a religion and philosophy of individualism, rebellion against oppressive authority, and opposition to arbitrary social convention. Why Satan and why call it Satanism? Satan means adversary, or the one who opposes, so that is an archetype that makes sense. Prometheus could be used, but Satan has more cultural impact. It’s called Satanism because the combination of different philosophies is best summed up by the symbol of Satan, and “ism” being the appropriate suffix for a set of concepts. What about the ‘atheistic’ part? The prefix “A”, means “not” or “other than”, and comes from Greek. It has the same meaning as the Latin prefix “non”. Theistic is the adjective form of the word meaning belief in gods, or pertaining to gods. So, ‘atheistic’ is an adjective meaning a lack of god belief or NOT pertaining to gods. It varies a little by context. What about the context of Atheistic Satanism? When used with the word “Satanism”, it’s an adjective describing the type of Satanism. It means Satanism without a deity, which means a metaphorical Satan. Theistic Satanism has a literal Satan. It may be spiritual or anthropomorphic, but it’s believed to be an actual being by theistic Satanists. The other kind of Satan is metaphorical. That is where Satan is an archetype or symbolism. So, all “atheistic Satanism” means, is that it’s a type of Satanism with a metaphorical Satan. So atheistic Satanists are atheists? Yes, almost exclusively, but that isn’t the exact meaning. An atheistic Satanist has a metaphorical Satan. In almost 100% of cases the only deity a Satanist might believe in, is Satan. So atheistic Satanists would virtually always be atheists. However, a person who believes in some sort of spiritual entity, but also identifies with the archetype of Satan, could be an atheistic Satanist but still be a theist. This is extremely rare though. Wouldn’t some atheistic Satanists only be agnostic and not atheist? That’s like asking a man if he is a father or a doctor. Two entirely different things. As an atheist is anyone who isn’t a theist (person with a belief in a deity or deities), they lack that belief. Usually they will be agnostic as well, meaning they lack knowledge, or see the god concept as unknowable. Many god concepts aren’t falsifiable, so you can’t have knowledge, nor is there any reason for belief. Frequently an atheistic Satanist will be an agnostic atheist, but there are a small minority who make a positive claim that there can be no deities. Atheistic Satanism is an oxymoron! That’s what non-Satanic atheists and theistic Satanists say. Sometimes that’s ignorance, sometimes it’s butthurt, sometimes it’s lacking the mental ability to understand what a metaphor is. That’s what the fundamentalist LaVeyans say. Clearly it’s not redundant as some people think it’s an oxymoron and/or believe in a literal Satan. It’s counterproductive going around playing the ‘not a real Satanist game’. That’s the sort of stupidity that should be the most painful. Fortunately most LaVeyans and members of the Church of Satan are much more moderate. Doesn’t one of the organizations in the side bar identify as nontheistic instead of atheistic? It means a metaphorical Satan, and they have a metaphorical Satan according to their FAQ. It states quite clearly they do not believe in the supernatural. That would seem to preclude deities. I’ll leave it at that, as this is not the place to critique philosophies, linguistics, or sincerity. I’ve read different accounts of Satanism that seem to disagree over what the basic beliefs are. What are the true beliefs of Satanism? Like most religions, Satanism has evolved over time and branched out as different groups have made their own interpretations of the basic message. Much like Christianity, which has Catholicism and numerous Protestant sects, Satanism has different groups that emphasize different aspects of the philosophy or have slightly different basic theological tenets. Satanism is deliberately a very individualistic religion, however, so in another sense there are as many different “branches” of Satanism as there are Satanists. We encourage this diversity. Does this website side with one “sect” or type of Satanism more than others? This website is closely aligned with the United Aspects of Satan‘s view of Satanism. The Satanic Temple is fairly similar, but primarily focuses on political activism. These contrast with the views of the Church of Satan, which is much closer to “LaVeyan Satanism” (see the History list, below). Can you explain more about the differences between the United Aspects of Satan (UAoS), The Satanic Temple (TST), and the Church of Satan (CoS)? One good way to get a sense of the differences is to read the FAQ’s on their websites: UAoS FAQ vs TST FAQ vs CoS FAQ. Seeing the differences in their responses to basic questions will give you a feel for the overall differences between the groups. If I am more of a LaVeyan Satanist, do you not want me here on your website? All Satanists are welcome. We hold no antipathy toward any Satanist. LaVeyan Satanists may feel uncomfortable with some of the social and metaphysical views of UAoS and TST Satanists, but Satanism is also about accepting individuality: if you can handle the differences, then so can we! In 1966, Anton LaVey founded the “Church of Satan.” Philosophically, he emphasized hedonism, libertarianism, social Darwinism, and the personal and psychological power of ritual and symbols. Influential philosophers included Aleister Crowley, Friedrich Nietzsche, Ayn Rand and Ragnard Redbeard. In 1969, LaVey wrote “The Satanic Bible” to systematize his beliefs. In the spirit of symbology and ritual that he espoused, the book is written in a style that emulates traditional spiritual and prophetic texts. However, he makes it clear that he does not view Satan as a real supernatural being, but as a literary figure and a symbol of dark and powerful earthly forces. In 1975 Michael Aquino breaks away from the Church of Satan to form the Temple of Set: a religion that is influenced by Satanism but believes in the literal existence of supernatural entities like Satan and Demons. In the 1980’s, there was a great deal of “Satanic Panic” among Christians who thoughts that “Satanists” were doing awful things. This was completely unfounded and had nothing to do with the religion of Modern Satanism. In 1992 LaVey made a documentary entitled “Speak of the Devil” about the the history of Satanism, and the Church of Satan. In 1997, LaVey died of heart failure. In 1999, Karla LaVey formed “The First Satanic Church” which followed the same ideology and beliefs as the Church of Satan founded by her father. In 2012, Doug Mesner co-founds The Satanic Temple. This group breaks away from the “Magic and pleasure” focus of the CoS, instead focusing on teaching a greater understanding of community, morality and “deeply held beliefs” from a scientific and atheistic perspective. They begin several projects of political activism, especially focusing on issues of human rights and separation of church and state. In 2015, Damien Ba’al wrote “The Satanic Narratives“, an expression of Satanic religious beliefs and symbology that breaks away from the Laveyan philosophy espoused by the Church of Satan, and is more in line with the beliefs about activism and social justice promoted by The Satanic Temple. The book makes it clear, however, that it is not trying to define a “one true Satanism” and is instead sharing one perspective of many so that every person interested in embracing Satanism as their religion can find their own approach that they feel comfortable with. 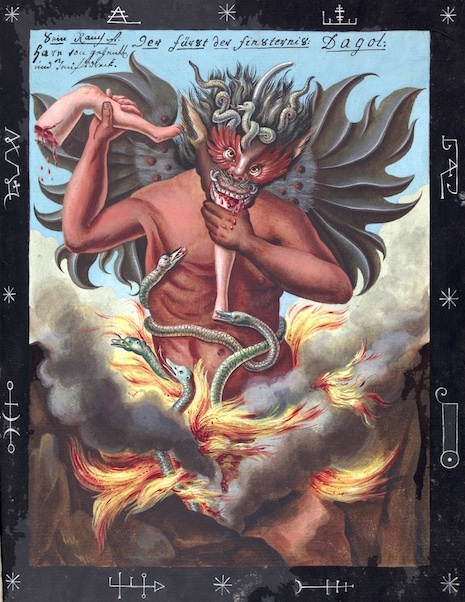 Using The Satanic Narratives as the philosophical foundation, Damien founded the United Aspects of Satan that same year.